An idyllic beach retreat, this is a proper slice of paradise on the Southern tip of Sri Lanka, this dreamy white beach is barely touched by tourism, it’s a secret gem known only to local fishermen and surfers. The beachfront resort here is nestled amongst the trees just behind the beach, catching the sea breezes and providing shade. There’s also a freshwater pool and plenty of spaces to relax and unwind with a book. Meals are held in a beautiful open sided restaurant, and the owners here are proud of the food they grow in the on site gardens. Their organic vegetables and herbs plus other local produce make fresh and healthy dishes that fuse western and Sri Lankan flavours. The on site spa offers massages and beauty therapies, plus a host of authentic Ayurvedic therapies too. So whether it’s a deep tissue massage to soothe your muscles, a papaya and honey facial to pamper yourself, or a relaxing Ayurvedic Shirodhara (where warm oil trickles over your forehead in a magically soothing way), there are plenty of options to choose from. 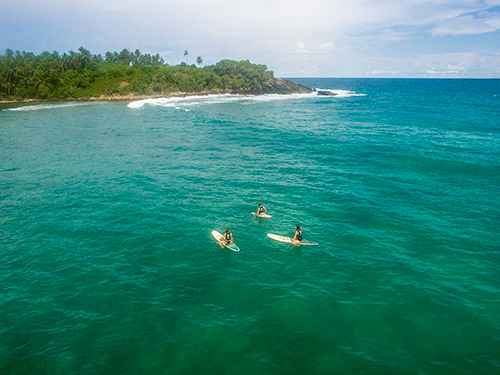 There is some fantastic surf in this area, so whatever level you’re at, if you fancy grabbing a board and hitting the waves, surfing lessons and surf trips are available with some of the best secret spots in Sri Lanka on the doorstep. Private one-to-one surf lessons are a great way to get your feet wet, and at just £40 for an hour and a half with your own instructor you could come home a pro! As well as the pristine white beach, you can enjoy a dip in the twenty metre freshwater swimming pool, or a shady walk around the coconut grove and lush gardens – the only thing to disturb you may be the occasional chattering of monkeys in the trees nearby! With the vivid tropical greens of the unspoilt nature all around you, it’s a visual feast that nurtures the soul. ...and luxurious eco-accommodation with sea breezes. The rooms here are carefully designed to maximise your enjoyment of the tropical environment. 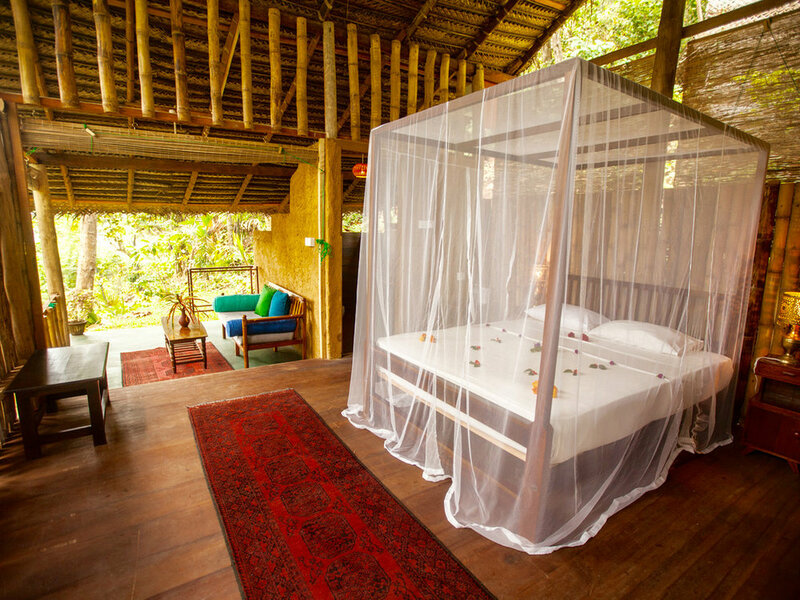 They range from gorgeous bamboo huts to luxurious sea view villas, some with open sides to let the outside in. All offer open-air bathrooms and private patios or terraces. Sri Lanka is a rich and vibrant country to visit, it’s stunningly beautiful, and has many interesting sites you can visit during your stay. Day trips and other activities can be organised once you arrive. The city of Galle is not far away, and is well worth a visit. This old colonial fort town has been transformed in recent years to become an enclave of artists and antiques. It’s great for a wander around the old streets, and we can arrange a cooking class here if you’d like to master some local dishes. Other day trips can take you further into the tropical nature that edges the beach, with buddhist shrines, rock temples and other ancient sites to visit nearby, as well as blowholes, a bird sanctuary and turtle watching - or of course you could just try out some other beaches in the area! For those that want to see big game, Yala National park is just 2.5 hours away. The main international airport in Sri Lanka is Colombo, about 168 km from the retreat centre, the journey time is about 3 hours. We can arrange transfers for you from Colombo airport. Taxis are very reasonable in Sri Lanka, the cost of a taxi from the airport to the resort is about 16000 Sri Lankan Rupees, approx £75. To minimise costs we will suggest shared rides for those arriving at similar flight times. Another way to travel is by train, it’s an adventure and a great way to see the countryside. Fairly frequent (8 per day) trains run from Colombo Fort to Matara (30 minutes from our location). The journey takes 2.5 - 3.5 hours depending on the train. The train is a fun and very low cost option, with a second class ticket costing just over £1. Many of the trains on this route have only second and third class but the early morning train, leaving at 6:55am has a first class option. If you take the train we can help you arrange a taxi for the final 30 minutes to the retreat. Whichever route you prefer, we can help you work out a stress free transfer option. It’s also worth noting that you do need a visa for Sri Lanka, but there is an electronic visa scheme in place, so all it should take is a few clicks online. To make things even easier on yourself we recommend Visa Genie who, for a few pounds, will do the whole thing for you.